Reading Rainbow episodes teach students the importance of their surroundings for a better appreciation for their environment. Reading Rainbow DVDslike Alejandro’s Gift is no exception. 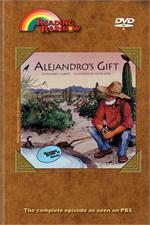 In this episode, Alejandro learns the importance of water and how it impacts his environment. LeVar explains the importance of water to all living things. Students are also transported to Niagara Falls where they learn how water can used as a power source. Purchase this along with other Reading Rainbow episodes to teach students the importance of this natural resource. Desert Scenes - Pictures of a variety of desert animals including a fox, snake, roadrunner, and a lizard. At the Oasis - LeVar introduces us to Morgan Levine, a Naturalist, who explains where this oasis water comes from and how it was used by the Cahuilla Indians. They explore the desert together. Niagara Falls - Climb aboard and get an up close look at Niagara Falls on a boat trip. Reading Rainbow DVDs like this one are great for science lessons. It introduces different environments and habitats. Science concepts also include saturation, solvents, water as energy producer, dehydration, and evaporation. Alejandro’s Gift is a nice way to grab your students’ attention and get them interested.